"We are delighted to offer you beautiful bespoke textile products all beautifully handmade in the 'Cathedral City of 'Lincoln'. Here at Smiley Miley Design we LOVE to design, and work very hard to create something very unique and special for all our customers. We also offer off the peg products in our boutique section that are ready for you to purchase, even some of these can personalised for you such as the Hairclip Holders and Christmas Stockings. Our products currently range from, Textile Canvas's, Bags, Cushions, Bunting, Aprons, Dresses, Tops, Hairclip Holders, Blankets, Brooches, Gadget covers to our Christmas range of Stockings, Bunting and Tree Decorations. 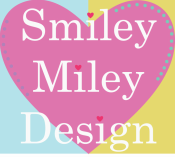 Any requests or suggestions please get in touch via our Contact tab or email us at smileymileydesign@gmail.com, we would love to hear from you"..